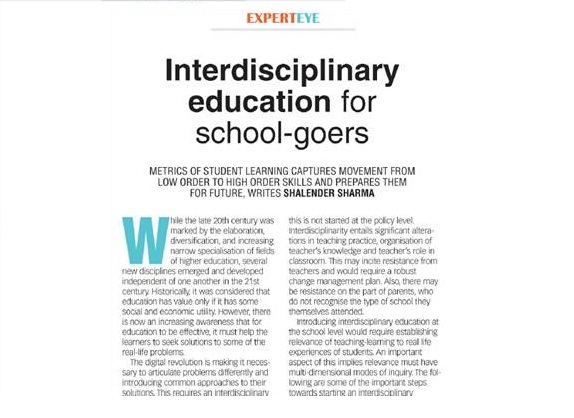 Shalender Sharma, Director - Education and Skills Development, IPE Global gets exclusively covered in Times of India- Higher Education: A Guide to Opportunities in India and Abroad, February 2019 edition where he talks about the Interdisciplinary Education for School- Goers. “Real-Life problems are not divided up into disciplines, therefore, they must be tackled through inter-disciplinary approaches”, writes Shalendra Sharma. He also adds some important steps towards starting an interdisciplinary educaton system like, Education policies, System of Constructive feedback, Collaboration of teachers, etc.